Accounting for all the energy that enters and leaves the Earth system helps us understand why the planet is warming. This accounting of energy is known as Earthâ€™s radiation budget. This kind of radiation isn't the kind from atom bombs or nuclear power plants. Instead, it is electromagnetic radiation. It is mostly visible light and infrared radiation. The diagram below shows where the energy goes. Numbers on the diagram are watts per square meter (W/m2 or WÂ·m-2). Imagine laying out a one meter by one meter square on the ground. Now measure how much solar energy falls on that square each second. That's what we're talking about here. 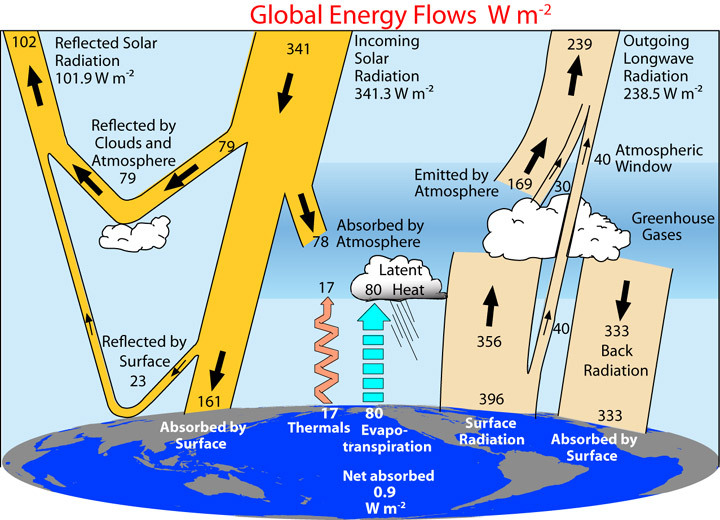 The average energy from sunlight coming to the top of Earth's atmosphere is around 341.3 W/m2. Less than half of the incoming sunlight heats the ground. The rest is reflected away by bright white clouds or ice or gets absorbed by the atmosphere. The sunlight that makes it to the ground warms the Earthâ€™s surface. The warm ground and oceans give off infrared (IR) radiation, which we feel as heat. That IR radiation or heat moves back up through the atmosphere. Most of it is trapped by greenhouse gases, preventing them from leaving as fast as them arrived. After a while, the IR radiation leaks back out into space. For the most part, the energy coming to Earth as sunlight equals the energy leaving as IR. If it doesnâ€™t, Earth heats up or cools down. Recently the energy budget has not been balanced. As we add greenhouse gases to the atmosphere, they trap more heat close to the planet and Earth warms. Many different things cover the Earth such as soil, rocks, water, forests, snow, and sand. Materials like these have different ways of dealing with the solar energy that gets to our planet. Dark colored surfaces, like ocean and forests, reflect very little of the solar energy that gets to them. Light colored parts of the planet surface, like snow and ice, reflect almost all of the solar energy that gets to them. The amount of energy reflected by a surface is called albedo. Albedo is measured on a scale from zero to one (or sometimes as a percent). Very dark colors have an albedo close to zero (or close to 0%). Very light colors have an albedo close to one (or close to 100%). Because much of the land surface and oceans are dark in color, they have a low albedo. They absorb a large amount of the solar energy that gets to them, reflecting only a small fraction of it. Forests have low albedo, near 0.15. Snow and ice, on the other hand, are very light in color. They have very high albedo, as high as 0.8 or 0.9, and reflect most of the solar energy that gets to them, absorbing very little. The albedo of all these different surfaces combined is called the planetary albedo. Earthâ€™s planetary albedo is about 0.31. That means that about a third of the solar energy that gets to Earth is reflected out to space and about two thirds is absorbed. The Moonâ€™s albedo is 0.07, meaning that only 7% of the energy that gets to it is reflected. If Earthâ€™s climate is colder and there is more snow and ice on the planet, more solar radiation is reflected back out to space and the climate gets even cooler. On the other hand, when warming causes snow and ice to melt, darker colored Earth surface and ocean are exposed and less solar energy is reflected out to space causing even more warming. This is known as the ice-albedo feedback. Clouds have an important effect on albedo too. They have a high albedo and reflect a large amount of solar energy out to space. Different types of clouds reflect different amounts of solar energy. If there were no clouds, Earthâ€™s average albedo would drop by half.